Three great monster t-shirts! Random from our current stock. May or may not be pictured. Quality screened (not transfers) shirts. 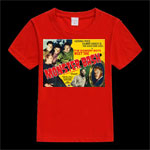 Three grab bag various monster t-shirts! All pre-shrunk cotton. Men's sizings. Sorry, no requests, will be a mystery. Get your monster fashion rocking! He's big, bad, bodacious and screams out "I'm a Monster Kid!" It's the original Shock Monster based on the crazy cool rubber mask ads from the 1960s. Vivid colors on a quality 100% cotton pre-shrunk black shirt. Quality screen scream printing. In men's sizes SMALL - XXXL. Wow! 100% pre-shrunk cotton, jungle green KING KONG 85th anniversary t-shirt. While supplies last, sizes are men's SMALL, MEDIUM, LARGE, XL, 2X, 3X. Select size in pull-down option. 100% Pre-Shrunk Cotton comfortable green tee shirt with quality silk-screened image. Heavy Guildan shirt. Santa claws is here. While supplies last, sizes are men's SMALL, MEDIUM, LARGE, XL, 2X, 3X. Select size in pull-down option. Retro Christmas Frankenstein Santa. Face is BIG on front of shirt. 100% pre-shrunk comfortable cotton black shirt with quality silk screen image. Bela Lugosi as Dracula in red web background. Official licensed Universal Studios and Bela Lugosi Entertainment shirt. Men's sizing. Bela Lugosi says "Look into my eyes!" Bela Lugosi as the vampire king, DRACULA. 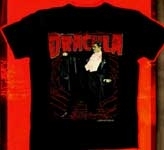 100% pre-shrunk black t-shirt with vivid screen image of Lugosi as Count Mora (DRACULA). Men's sizes. Official Universal Studio licensed. Creepy and comfortable. 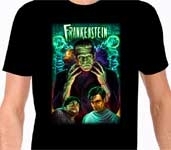 100% cotton black quality t-shirt with screen print of Frankenstein Monster faces! Glenn Strange, Boris Karloff, Bela Lugosi, Lon Chaney Jr. 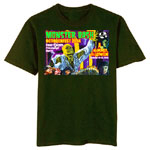 Licensed Universal Studio t-shirt in ghoulish greens. 100% Pre-Shrunk Cotton comfortable black tee shirt with quality silk-screened image. A classic Halloween image of a brilliant flaming skull. Freaky. 100% pre-shrunk cotton black t-shirt. Men's sizes. 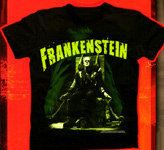 This creepy cool shirt features the Frankenstein Monster chained in chair from THE BRIDE OF FRANKENSTEIN. Boris Karloff rocks! He's green and clammy....Boris Karloff as Frankenstein's Monster! 100% pre-shrunk black t-shirt with vivid screen image of Karloff. Men's sizes. Official Universal Studio licensed. Creepy and comfortable. 100% cotton, comfortable pre-shrunk black t-shirt! Pictured from the 1931 classic FRANKENSTEIN, the unholy trio: Boris Karloff as the monster, Dwight Frye as the hunchback assistant - Fritz, and Colin Clive as Henry Frankenstein. Quality screen print, men's sizings. GORGO smashes London Bridge and is heading for your town. This black t-shirt is 100% pre-shrunk cotton with a quality color screen image. Men's sizes. Creepy and comfortable. Dracula attacks - get scared! 100% cotton black pre-shrunk t-shirt. Comes in men's sizes. It's horrible, it's nasty, it's freaky....everyone wants one! The "Horror Witch" T-Shirt. This hideous, drooling face in lovely greens on a black t-shirt. 100% pre-shrunk cotton quality shirt with quality screen art face. Click "Options" for your size. Officially licensed tee from Universal Studios. High quality black shirt with screen image. Shirts are 100% pre-shrunk cotton. It's Lon Chaney as the bell-ringer of Notre Dame....Quasimodo - The Hunchback in all his gory glory. Official Univeral Monsters (TM) tag inside! Quality Gildan t-shirt with color silk screen image. Proudly wear your bodacious giant ape shirt for all occasions. Shirt color black mixes and matches with all outfits. Be the fashion statement of your monster club today. 100% pre-shrunk cotton. Men's sizes. 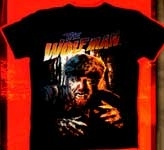 The monster, Count Dracula and The Werewolf clash and bash on this deep purple shirt. Vivid colors on a quality 100% cotton pre-shrunk shirt. Quality screen scream printing. In men's sizes SMALL - XXXL. Wow! 100% comfortable cotton black t-shirt, with full color screened image! The Martians have landed and they're Monster Bashin'! Pre-shrunk men's sizes. A required wardrobe for all earthlings. Get ready for an extraterrestrial season. Pre-shrunk cotton. Call for size 3X (724) 238-4317. 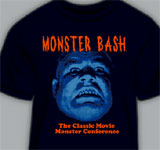 100% pre-shrunk cotton shirt for the June 2015 MONSTER BASH CONFERENCE. 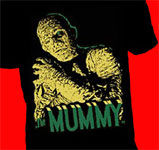 The Mummy is coming to get you! Shirts are black and are men's sizes. Quality silk screen image. 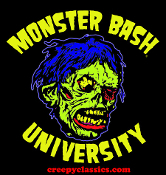 The MONSTER BASH CONFERENCE T-Shirt for October 2014. Snarling werewolf, Dracula, Hammer Horror girls...there'll all there on the official t-shirt for MONSTER BASH October 2015. Screen printed on Army green 100% pre-shrunk cotton shirt. Men's standard t-shirt sizes. Black 100% cotton pre-shrunk black t-shirt! Sports the lovely "Shock Monster" sure to scare your sister. It's the "Monster Bash University - Shock Monster" shirt. Become a monster graduate today and order your shirt! Big shock monster screen printed. He's cursed and he's mad! Lon Chaney, Jr. as Kharis, The Mummy. 100% pre-shrunk black t-shirt with vivid screen image of Lon Chaney, Jr. Men's sizes. Official Universal Studio licensed. Creepy and comfortable. Tana leaves not included (for your own good). Black 100% pre-shrunk cotton men's t-shirt. Features Kharis, the centuries old mummy with creepy look! Glows in the dark. Click options pull down to select the size you want. Officially licensed through Universal Studios! Black 100% pre-shrunk cotton men's t-shirt. 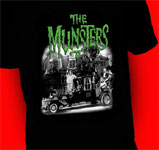 Features The Munsters family in the family coach at 1313 Mockingbird Lane. Click options pull down to select the size you want. Officially licensed through Universal Studios! 100% Pre-Shrunk Cotton comfortable black shirt. High quality silk screen image. Men's sizes. The silent vampire stalks on the stairs....creeped out! Lon Chaney as THE PHANTOM OF THE OPERA....glows in the dark! 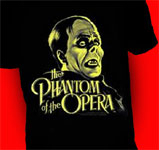 100% pre-shrunk black t-shirt with vivid screen image of Chaney's Phantom. Men's sizes. Official Universal Studio licensed. Creepy and comfortable. Click "options" to select sizes available. 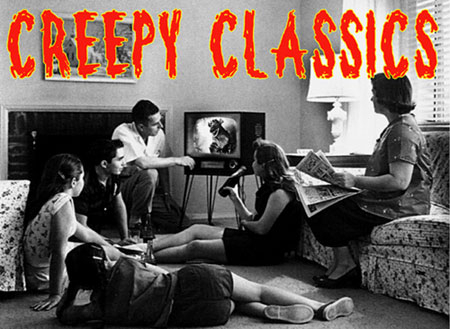 The retro monsters of the 1960s are back! 100% cotton, pre-shrunk new quality shirts. Full color screen art. Your favorite monster on black t-shirt. Select your size. Image on front. 100% pre-shrunk cotton. Quality black t-shirt with professional, brilliant silk screen image. Get YOUR Gill Creature today and wear him proudly. Men's sizes. Image on front, black t-shirt. Officially licensed tee from Universal Studios. High quality black shirt with screen image. The monster in green-blue is coming for you! Shirts are 100% pre-shrunk cotton. Official Univeral Monsters (TM) tag inside! Ohio TV Horror Host SON OF GHOUL official t-shirt. Quality black t-shirt with silk screen image of the television ghoul ghost host. PLEASE NOTE: that the option for 2X size is really a 3X shirt. There are no 2X size in this particular shirt. It's night time at the retro drive-in....1950s cars are facing the creature feature on the screen. Be proud and support your local drive-in with this t-shirt. Quality 100% cotton pre-shrunk black shirt. Quality screen scream printing. BACK IN STOCK! 100% Pre-shrunk soft cotton black shirt with quality silk screen image. Official Universal Studios licensed shirt. Men's size. Lon Chaney Jr. as the werewolf in Autumn orange colors! Officially licensed tee from Universal Studios. High quality black shirt with screen image. Shirts are 100% pre-shrunk cotton. Doesn't everyone want a broken-necked, hunchback on their shirt?! We do! Official Univeral Monsters (TM) tag inside!